A for sale sign at the County Hall site in Morpeth, with part of the building in the background. Major plans for the current County Hall, former fire station and Merley Croft sites in Morpeth have come in for strong criticism from Morpeth councillors. Northumberland County Council announced yesterday that an outline bid for up to 200 family homes and a detailed application for a commercial zone including a supermarket, smaller retail units, a cafe/restaurant and a pub are going to be submitted. The authority itself will submit a detailed bid for a new first school to replace the current school at Goosehill, following the announcement last month. This would be located to the front of the County Hall site. Residents will be able to see the plans for the area in Loansdean at a drop-in next week. County councillors were told of the plans yesterday and Coun Andrew Tebbutt, whose Morpeth Kirkhill ward includes these sites, believes there are various planning grounds on which to oppose the housing and commercial elements. He said it would exacerbate traffic congestion at the Telford Bridge and remove any opportunity to build the long-awaited Stobhill/Loansdean road link as a section of the planned residential area blocks the proposed route. He added: “I’m not the least bit surprised by what is being proposed for these sites, but the real frustration is that a lot of people have put in an enormous amount of effort over the last few years for the good of the town and the administration is riding roughshod over this work. “They really don’t care about the people of Morpeth and it makes me feel both angry and sad. “All previous planning policies have resisted edge of town supermarkets and other retail outlets because of the negative impact on the town centre. “The County Hall site, if vacated, is a mixture of employment land and designated open space, so housing would constitute a change of use. 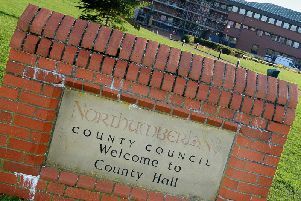 “The plans are totally contrary to the Morpeth Neighbourhood Plan (MNP) and the county council’s emerging Core Strategy. “Housing policy requires most houses to be built to the north of Morpeth and there are already more houses in the pipeline on designated sites than required under both the MNP and the Core Strategy. “It is contrary to the agreed policy (granted on appeal by a planning inspector) to permit a retail outlet on the Bellway site ‘over the road’ at South Loansdean. “The potential road link with Stobhill has been preserved for more than 20 years and it was always the question of having the money to do it. “Shutting off that opportunity shows that the administration doesn’t care about the need to relieve traffic in Morpeth in the years ahead. “It’s absolutely vital that residents attend the drop-in next week and have their say. Morpeth North county councillor David Bawn said: “These proposals are the final nail in the coffin of the Morpeth Neighbourhood Plan. “The blatant disregard for the plan by the administration is breathtaking. “These 200 additional houses are completely unsustainable – our town is already creaking at the seams with the developments already approved. “Furthermore, the creation of an unwanted out-of-town retail offering will add more pressure to our town centre and the viability of local businesses. The drop-in session will take place in the County Hall restaurant on Thursday, November 3 from 3pm to 7pm. The project team will be available to discuss the proposals and answer any questions and there will be an opportunity to provide feedback. Meanwhile, demolition works are set to begin at the former fire station site next week.